Except for in the unusual situation, metals act merely as reducing agents. Usually, the reactivity of the transition metals as reducing agents tends to reduce as you go across the periodic table from left to right. The trend in their reactivity can be associated to their electrode potentials. Group 3 metals comprising lanthanides and actinides are very strong reducing agents. The metals of Groups 4-7 are quite reactive as are iron, ruthenium, osmium, cobalt and nickel of Groups 8-10. The remaining metals of Groups 8-10, rhodium, iridium, platinum and palladium and also silver and gold encompass low reactivity. Due to this relative inertness, they are known as noble metals. Transition elements show a broad range of oxidation states differing generally by units of one. This is because of the fact that (n-1)d electrons might get involved all along by ns electrons in bonding, as electron in (n-l)d orbital are in an energy state comparable to the ns electrons. From The table shown below we can observe that there exists a general trend of lesser number of oxidation states at each end of the series and a higher number in the middle. The lesser number of oxidation states in the starting of the series can be due to the presence of too few electrons to lose or share, towards the end of series it can be credited to the presence of too many electrons and therefore some empty orbitals to share electrons by the ligands. To describe this trend, let us first notice at Group 6. It is comprised of Cr, Mo and W. We have observed that chromium in +6 oxidation state as in K2CrO4 is a good oxidising agent forming Cr as the product. This signifies that in most of the instances Cr(III) is more stable than Cr(VI). In contrary, molybdenum and tungsten are not simply reduced whenever they are in +6 oxidation state in K2MoO4 and K2WO4. This means that the lower oxidation states, example: Mo(III) and W(III) are not as simple to form as Cr(III), making the +6 oxidation state more stable. Therefore the stability of +6 state for Group 6 elements will be W6+ > Mo6+ > Cr6+. We find out the similar trend in Group 4 that is comprised of Ti, Zr and Hf. For all the three elements, most Stable oxidation state is +4. Though Ti(II) and Ti(III) can be made from Ti(IV) by the use of good reducing agent however lower oxidation states of Zr and Hf are very difficult to prepare. 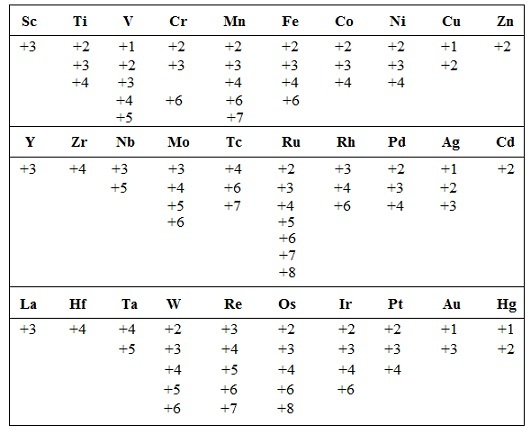 The table illustrated below represents how different oxidation states of several elements of period-4 tend to react with respect to the oxidation and reduction. The other feature is the reduced tendency of higher oxidation states towards the end of the series. This could be due to stable increase in the effective nuclear charge all along the series therefore pulling the d-orbitals to the electron core and not making them readily available for bonding. For illustration, the only oxidation state for Zn is Zn(II) where no d orbital is involved. On the other hand, early in the series, it is hard to form species which don't make use of the d electrons that is, Sc(II) is virtually unknown and Ti(IV) is more stable as compare to Ti(II). Now let us observe the trend in the oxidation states as we go down the group. 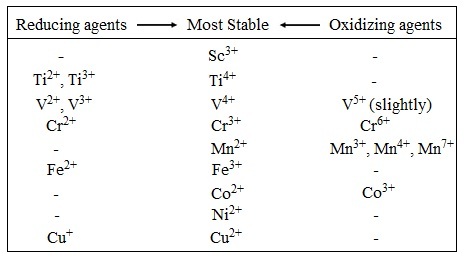 A complete or full range of oxidation states of the transition elements is illustrated in the table shown above. The trend in stability of oxidation states within the groups is dissimilar for the transition elements and the major group elements (that is, s and p block elements). For the main group elements, the higher oxidation state becomes less-stable going down a group due to inert pair effect. Though, for the transition elements the stability of the higher oxidation states raises going down the group. Going from left to right across the period 4, M2+(aq) ions are acknowledged for the last seven elements from V to Cu and M3+(aq) ions are acknowledged for the first seven elements from Sc and Co. Therefore, there is an overall increase in stability of M2+ (aq) with respect to the oxidation as one moves across the series. Though, in the case of iron, Fe2+ (aq) is less stable as compare to Fe3+ (aq) due to the extra stability related with half-filled (d5) orbitals in case of Fe3+ (aq). The highest oxidation, states are often stabilized in the oxide and fluoride compounds, example: MnO4, CrO4 VO2, VF5 and so on in these compounds O2- and F- are difficult to be oxidized via the central metal as O and F are very strong oxidising agents. By now you should be familiar by the term 'complexes'. The chemistry of the transition metals is dominated via their tendency to form complex ions. This is due to the transition elements form small, highly charged ions which encompass vacant orbitals of appropriate energy to accept lone pairs of electrons donated via other groups or ligands. In case of transition metals in high oxidation states, highly charged ions can strongly bind electrostatically a broad variety of negative or polar ligands. In case of transition metals in low oxidation states, the electrons in the d orbitals become comprised in π bonding with ligands. The majority of transition metal ion complexes have six ligands surrounding the central ion octahedrally. A few elements comprise of four ligands which are either arranged tetrahedrally or less frequently at the corners of a square. Besides such geometries, other geometries such as trigonal bipyramid, pentagonal bipyramid, and so on, are as well present occasionally. The bonding between the ligand and transition metal ion can either be mainly electrostatic or covalent or in most of the cases intermediate between the two extremes. A few typical complexes of the transition metals are [Fe(CN)6]3-, [Ni(NH3)4]2+, [Cu(CN)4]3-, [C(NH3)4]2+ and so on. The compounds of transition elements are generally markedly colored, in contrary to compounds of s- and p- block elements that are mostly white or colourless unless the anion is colored. As we are familiar that substances appear colored whenever they absorb light of a specific wavelength in the visible region of the spectrum and transmit light of other wavelengths. The colour that we see is the colour of the transmitted wavelengths. In another words, the colour of compound noticed by us is the complementary colour of the colour absorbed by the compound. We are familiar that the transition metals as such or in the form of ions have partially filled d-orbitals which are degenerate, that is, they are of equivalent energy. We as well know that in transition metals complexes the d - orbitals don't remain degenerate, however these divide into sets of orbitals of different energies. By absorbing energy, electrons can move from a d-orbital of lower energy to that of the higher energy. This transition of electron from one d-orbital to the other corresponds to a fairly small energy difference; thus, light is absorbed in the visible area of spectrum. For illustration, the aqua ion Ti(H2O)6+3 that consists of one electron in the 3d orbital absorbs light of wavelength in the yellow-green region of spectrum and thus, appears reddish violet in colour. 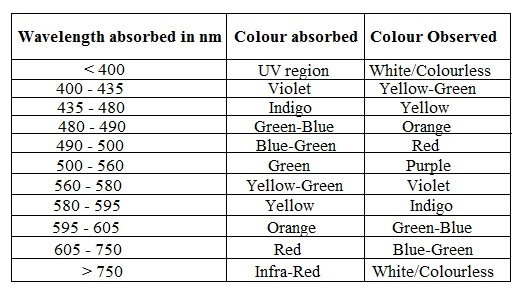 The table illustrated below gives the relationship between the colour and wavelength of light. If the d-orbitals are completely filled or empty, there is no possibility of electronic, transitions in the d-orbitals. In these cases, the ions will not exhibit any colour. For illustration, the compounds of Sc3+, Ti4+, Cu+ and Zn2+ are white or colourless. 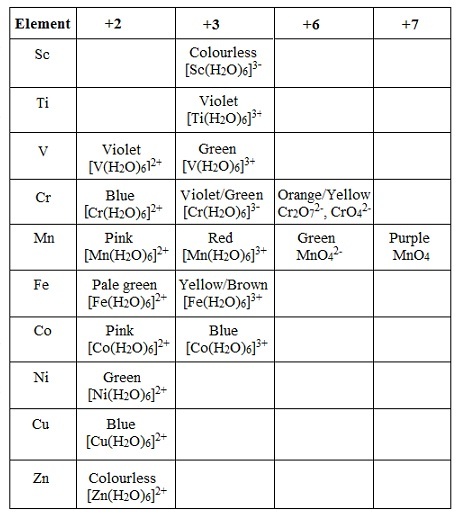 The table illustrated below gives the colour and oxidation states of the metal ions present in several hydrated ions of the transition elements. In the s- and p- block elements there can't be any d-d transitions and the energy required to promote s or p electron to a higher level is much greater and might correspond to ultraviolet region, in which case the compound will not appear colored to the eye. Whenever you place an iron piece close to a magnet, we will observe that it is instantly drawn towards the magnet. Though, a few elements are repelled by the magnets. The property of an element to be attracted or repelled via a magnet varies from element to element. Substances that are weakly repelled via a magnetic field are known as diamagnetic, whereas the substances that are weakly attracted by the magnetic field and lose their magnetism if removed from the field are known as paramagnetic. If the force of attraction is extremely large and the permanent magnetization is retained, the substance is stated to be ferromagnetic, example: iron and a few iron compounds. Electrons find out the magnetic properties of matter in two ways. From the pre-wave mechanical point of view, the electron might be considered as a small sphere of negative charge spinning on its axis. Then from the fully classical considerations, the spinning of charge generates a magnetic moment. Secondly, an electron travelling in the closed path (orbit) around a nucleus, again according to pre-wave mechanical picture, will as well produce a magnetic moment. The magnetic properties of any individual atom or ion will yield from some combination of these two properties, that is, the inherent spin moment of the electron and the orbital moment resultant from the motion of the electron around the nucleus. In the above expression, 'S' is the sum of spin quantum numbers and 'L' is the sum of orbital angular momentum quantum numbers of all the electrons. In most of the compounds comprising those of the first row transition elements, the orbital contribution is quenched out via the electric fields of the surrounding atoms and as an approximation, the observed magnetic moment might be considered to occur only from unpaired spins. Place L = 0 in the above expression, we can obtain the spin-only magnetic moment µs. The spin-only magnetic moment, µs can as well be associated to the number of unpaired electrons, n, in any species, as the net spin quantum number S = n/2. Diamagnetic materials contain no magnetic moment and exhibit a slight reduction in the weight on weighing in the presence of magnetic field. On the other hand, paramagnetic materials exhibit an apparent increase in weight. The magnetic moment can be computed from the change in weight. 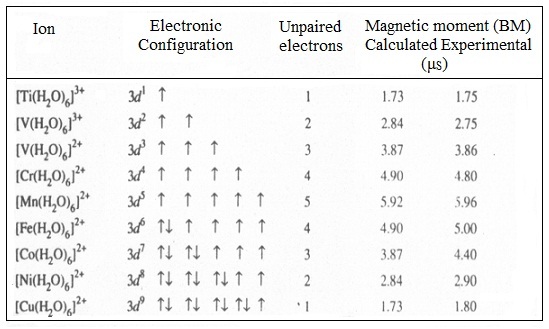 In several cases (example: Mn2+ or Fe3+, in which all the d-orbitals are occupied singly via electrons for which m1 = 2, 1, 0, -1 and -2, giving L = 0) the observed magnetic moment values agree very well by the spin-only value as given in the table illustrated below. However usually, experimental values vary from the spin-only values. This is due to the reason that the orbital motion of the electron as well makes some contribution to the moment. a) FeSO4 and H2O2 as Fenton's reagent for the oxidation of alcohols to Aldehydes. c) Fe/Mo in the manufacture of ammonia via Haber method. d) Pt/PtO as Adians catalyst for the reductions. e) Pt/Rh in oxidation of NH3 to NO in the manufacture of the nitric acid. f) V2O5 in oxidation of SO2 to SO3 in the manufacture of sulphuric acid via contact process. g) Ni (Raney nickel) in the reduction processes. h) TiCl4 as (Ziegler Natta Catalyst) for the polymerisation of ethene. Transition metals are significant catalysts in the biological systems. A number of transition elements present in extremely small quantities in plants and animals are necessary for the enzymes to function. For illustration, a cobalt atom lies at the centre of the vitamin B12 coenzyme. Iron atoms are significantly comprised in hemoglobin of blood and in the ferrodoxin of photosynthetic method. Both molybdenum and iron are contained in the nitrogen fixing enzymes. Transition metals can trap a few small atoms such as hydrogen, boron, carbon, nitrogen and so on, in vacant spaces in their crystal lattice making interstitial compounds. Carbon and nitrogen for all time occupy octahedral holes; hydrogen is smaller and for all time occupies tetrahedral holes. As just transition metals form such compounds, the d electrons are, thus, presumably comprised in the bonding. The structure of the metal frequently changes throughout the formation of such compounds. The composition of such compounds is usually non-stoichiometric, example: TiH1.73, PdH0.56, VH0.56, however might approach regular Stoichiometry and a regular structure, example: TiC and VN. The later transition elements of the first series form non-stoichiometric carbides by irregular structures, like Cr7C3 that are more reactive than the interstitial carbides of the early transition elements. Such interstitial compounds are of much significance, example: carbon steels are interstitial iron-carbon compounds in which the interstitial carbon prevents the iron atoms from sliding over one other, making iron harder, stronger however more brittle.